I have been waiting to read Jefferson’s Sons for ages and I finally got my hands on a copy of it (I have no idea why the wait list for a Kindle copy of it at the library was so incredibly long). And then I read it in one day. One of the clever things about this book is that it covers a long period of time (more than twenty years), but because the narrator switches several times, the main voice is always a child. This works wonderfully for a middle-grade novel. The first narrator is Beverly, Sally Hemming’s oldest living child. The book begins when he finds out from his mother that Master Jefferson is his father. He’s shocked to hear this, and has a hard time following his mother’s instructions to tell no one. As he grows older, he struggles with his mother’s claims that when he turns 21, he’ll be free and he ought to go live as if he is white (he’s only 1/7 black). He hates the idea of leaving his family behind and everything that he’s known. Also, he just about worships Thomas Jefferson and treasures any interaction they have (which is very limited). The second narrator is Beverly’s younger brother, Maddy. Maddy doesn’t feel the same love for Master Jefferson and his contempt for his father only increases as he grows older. Also, he’s not nearly as light-skinned as his siblings, and it seems unlikely that he’ll be able to pass for white when he’s an adult, which devastates him. The final narrator is Peter, the little boy of another slave family living at Monticello. He’s watched Beverly and Maddy grow up, and now he’s starting to see his parents’ worry about what might happen to their family after Master Jefferson dies. Of course, in many ways, Thomas Jefferson is the central character in this book, even though he rarely appears. How do you reconcile the man who wrote “all men are created equal” and then owns hundreds of slaves, including some that are his own children? I felt like the author did a magnificent job of laying out the facts of Thomas Jefferson’s life without offering heavy-handed judgement of his actions, but by the end of the book, I felt intensely that Jefferson really did some horrific things, perhaps without allowing himself to acknowledge them as such. So this is what it comes to. Never a visitor turned away. The finest food in the country on the table every night, the finest imported wine – the grandchildren decked out in silk dresses, the favors done for friends. One hundred thirty people to be sold. . . The champion of freedom, Maddy thought, who owned slaves. Who lived his life so that at his death one hundred thirty people must be sold. It’s hard to feel very admiringly toward someone who, in the last several decades of his life, chooses to live in a way that he must have known would require the unwilling sacrifice of all his slaves. And over the course of the book, it’s fascinating and horrifying to see how much negotiation and conflict takes place to keep everything running somewhat smoothly, while Jefferson remains virtually untouched by any of it. Slaves who are caught after running away are beaten at Jefferson’s orders, but he doesn’t have to do it himself or even watch it happen. His daughter, Martha, loathes having Sally’s children around because they look so much like her father, but he plays with his grandchildren and basically ignores his slave children. Sally, for her own protection and that of her children, keeps her relationship with Jefferson quiet, even though everyone knows who the father of her children is. This book deals with so many interesting themes – the stark segregation between white and black society that means that Beverly and Harriet, should they decide to pass for white, will never be able to trust a white person with their secret, the basic longing of a child for the attention and affirmation of a parent, the kinds of topics that everyone knows about but no one will discuss aloud, or how parentage often determines how a child is treated (Jefferson’s sons, although they are never acknowledged as such, are never given the worst jobs around the plantation). At what cost do you protect your own child? How does Sally deal with the conflict between her relationship with Jefferson and the fact that he owns both her and all their children? This novel would make for great classroom or book club conversation. 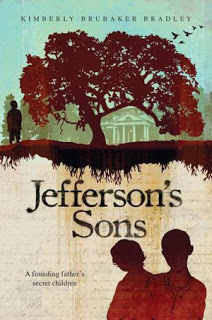 Jefferson’s Sons is really high-quality historical fiction. Someday, this is one I’ll be quick to include when my children study early US history. I’d highly recommend this to anyone. Adding this one to my Goodreads. Sounds really compelling. Thanks! Just ordered it from the library! Put a hold on it already. The whole dichotomy between what Jefferson wrote and did is one reason why Spencer's favorite founding father (and all-around hero) is John Adams. Well, also John Adams was a lawyer, so there's that as well. Wow – this sounds so much more complex and compelling than I normally think middle grade books are. Loved your review of it. Sounds fascinating, especially considering Sally Hemmings was the half sister of his late wife (more slave concubinage at work). There was a play in SLC recently called The Third Crossing (based on the idea that after three crossing of bloodlines in your ancestry, the white genetics would trump the black and you could legally be considered white) that is based on the Jefferson family story. He was an interesting man, very paradoxical. When we went to D.C. a few years ago we were both nearly brought to tears in the Lincoln Memorial and then were just super annoyed in the Jefferson Memorial. I would really like to read this book. Lucky me – my library had it available on Kindle (although I have to transfer via USB – ugh). Can't WAIT to read this. And after, we may need to finally make that trip to Monticello we've been planning for several years. I literally finished this book this morning and really enjoyed it. I've always had a hard time wrapping my head around the fact that some of the founding fathers weren't that great of human beings even though they did amazing things for our country. Why can't all leaders (then and now) be like John Adams?! Anyway, I think the part at the end when Peter is dealing with the fact that his family is going to be sold and separated is especially well written. This sounds so good; thanks for the review. I got this book from the library on the recommendation from your more recent post mentioning it. I looked up your review after reading the first 3 chapters and being really disappointed with the cutesy approach the book seemed to be taking toward slavery. Does it give a more complex view as the story goes on? At this point I'm ready to quit, but the glowing review is giving me pause. I'm a relatively new reader of your blog, but have read about five of the books you've recommended and really loved them – especially Upstairs at the White House and Being Mortal, and I'm just puzzling through why this one started out as such a flop for me. I honestly want to know your thoughts. You can email me if you have a minute, I would appreciate it! Thanks. I know you wrote your comment months ago but I can't help replying! I completely understand what you mean by a "cutesy approach to slavery in the first few chapters". At first that bothered me too, but as I read further, I understood that this was a function of the character, not the author. Beverly doesn't really UNDERSTAND slavery or how it impacts the people around him, or how it makes their experiences different from his. He's well fed, doesn't have to work until he wants to and where he wants to, and his family is never truly deprived or threatened to be split up. It's only as he starts to understand the meaning and significance of his parentage that he grasps slavery in a nuanced way, which I think is a mark of the author's understanding of children and their egocentric world view, not her lack of understanding of slavery. As Beverly grows he grasps it more, and Maddy and Peter both have good reasons to understand it sooner than Beverly, so you don't have to start over each time.